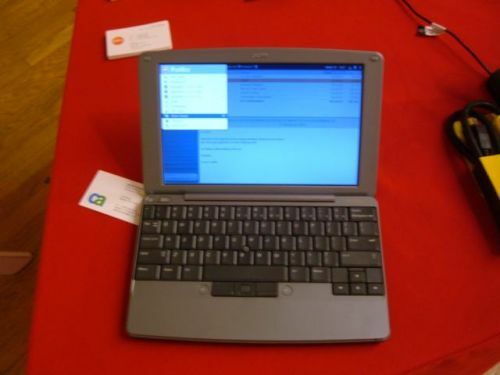 It may go down in history as a noble experiment that was wisely aborted just prior to perhaps going down in flames: Palm yesterday announced it has decided it won't be launching a little Linux laptop computer after all, devoting its entire marketing efforts instead to what many believe will be a smartphone called Centro to take on the RIM BlackBerry. "In the course of the past several months, it has become clear that the right path for Palm is to offer a single, consistent user experience around this new platform design and a single focus for our platform development efforts," wrote Palm CEO Ed Colligan for his company's blog yesterday. "To that end, and after careful deliberation, I have decided to cancel the Foleo mobile companion product in its current configuration and focus all of our energies on delivering our next generation platform and the first smartphones that will bring this platform to market." Other companies have gone further with attempting to ferret out a market in-between the smartphone and the sub-notebook, with very limited success if any. Intel and Microsoft had been working to develop an ultra-mobile PC platform; now, the two companies are going their separate ways, with Intel working on a more utilitarian derivative and Microsoft pursuing whatever it was it thinks it was pursuing with UMPC before. Palm's hopes weren't only to pry open the door for manufacturing larger devices, but to somehow maintain leverage against its existing and future smartphones by tying the two products together - thus the term "mobile companion product." Foleo would have featured a full-size screen and keyboard, but would rely on its Bluetooth link with the phone to send and receive e-mail. But when Palm showed a prototype of Foleo at a show in New York last May, the response from its prospective customers appeared to be a collective "Why?" As BetaNews reader xyzcb1 commented at the time, "No thanks. For $499, I will get a real laptop that does a lot more." Others were confused by Palm's logic behind intentionally constructing a device that eliminates the all-in-one value proposition in favor of a two-part contraption, at a total price point that wouldn't have beaten an all-in-one device. And as TG Daily's Wolfgang Gruener pointed out in May, if you do the math (perhaps you might borrow someone's Palm Treo for that task), the only way to arrive at the total market for such a device is through a subtractive route. "24.2 million people use their smartphones to send and receive e-mails," Gruener wrote. "But realistically, not all of those users have Palm OS and Windows Mobile devices. There are many users who have BlackBerrys, Symbian-based phones, and...iPhones - all of which will not be supported by the first version of the Foleo. Take all of those people out of the equation and then subtract from that all those people who have Treos and Windows PDA phones and do not need notebooks during their business trips. Suddenly that market does not look quite as big anymore." Brighthand product reviewer Ed Hardy got an opportunity to spend a few minutes of quality time with the Foleo last May. He noted that any similarity between using it and using a laptop disappeared when you started looking for the desktop. It wasn't there; instead, there was a file manager program that was more like using a phone but with a very big screen. Trying to do some real Web functions with Foleo's built-in Web browser, Hardy discovered a perhaps bigger problem: "One of the most controversial things about the Foleo is its weak support for multimedia. This brings up what could be the Mobile Companion's Achilles' heel: a strong need for third-party developers to embrace this new platform." "Our own evaluation and early market feedback were telling us that we still have a number of improvements to make Foleo a world-class product," wrote Palm's Colligan yesterday, "and we cannot afford to make those improvements on a platform that is not central to our core focus. That would not be right for our customers or for our developer community." But like a certain US senator, Colligan's language left the door open for a possible comeback. He mentioned something called "Foleo II," as something which would probably, at some future date, extend the core platform that Palm wants to focus on today. That unnamed platform is almost certainly Centro, the company's ultra-small smartphone believed to be ready for release in the fall. Bloggers from Treonauts managed to coax representatives from Sprint, Palm's likely US carrier, into showing them a prototype that they were demonstrating to investors last month. Centro has a very, very small keyboard, which may be the only opening Palm has left for possibly re-launching Foleo as a companion product, if such an opening exists.